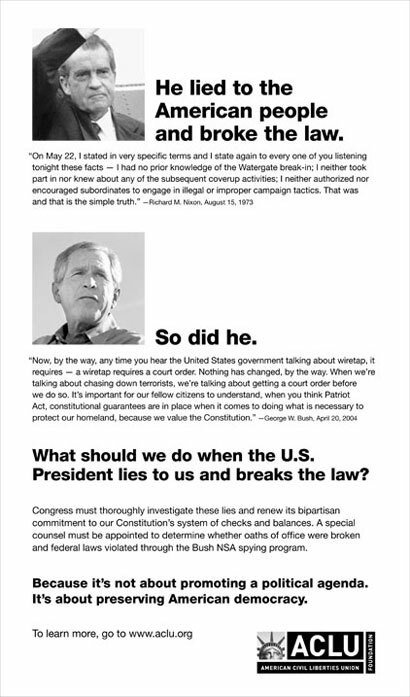 The ACLU has a full page ad in the New York Times today comparing President Bush to Richard Nixon and calling for a congressional investigation into the NSA wiretap program. My first thought was: well, there they go, bashing poor Mr. Nixon. It'll be fun to see all the Nixon apologists (Gordon Liddy, Ben Stein, etc.) coming out of the woodwork again. My favorite example of Nixon apologism gone over the deep end comes from the late seventies and involves a conservative commentator I generally like, James J. Kilpatrick. Dismayed over the Carters' populist informality, Kilpatrick growled, "at least Nixon preserved the dignity of the office."